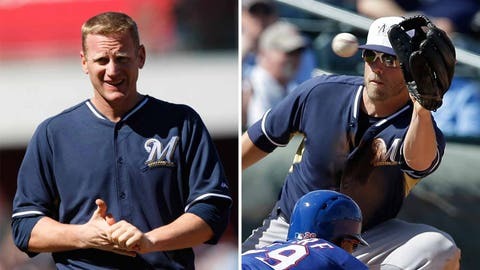 At first base, the Brewers have been platooning Lyle Overbay (left), who's hitting .100 on the season, and Mark Reynolds, who has a .226 batting average with three home runs and six RBI. MILWAUKEE — Two weeks into the regular season, Ron Roenicke is still waiting for a clear answer to emerge at first base and second base. Until then, he’ll continue to split up the playing time. Mark Reynolds appeared to be pulling away after starting seven consecutive games at first base, but Lyle Overbay got the call Sunday and Monday. Early on, Reynolds has provided the Brewers with about what was expected coming into the season. He’s hitting just .226 but has three home runs and six RBI while Overbay is 2-for-20 (.100 average). Roenicke said the decision to start Overbay against St. Louis on Monday had a lot to do with the fact left-handed hitters were hitting .500 on the season against Cardinals starter Lance Lynn. It appears what Reynolds has done thus far will earn him a good portion of the playing time, but certain matchups will land Overbay in the starting lineup. "I think at first base, when it matches up for Lyle to be in there, we’ll put Lyle in there," Roenicke said. "But I like what Reynolds has done. I would say when I’m not sure that Reynolds would be in there." The platoon at first base was initially thought to be an offense/defense one, but Reynolds has made multiple impressive plays in the field already. 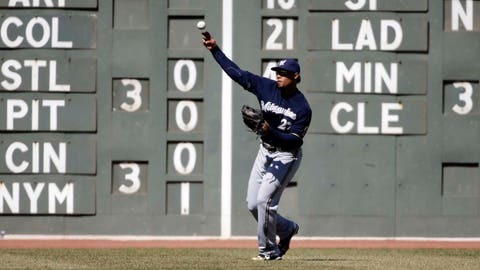 He started a slick 3-6-3 double play against Pittsburgh on Friday and helped the Brewers win Saturday by making a spectacular catch while keeping his foot on the bag in the ninth inning. "I take pride in it," Reynolds said of his defense. "It’s something I work at daily to get better over there. I just try to do the best I can with the opportunities I’m presented." Reynolds has shown to be a better defender at first base than Roenicke expected when the Brewers signed the veteran to a minor-league deal in the winter. "I would say so," Roenicke said. "Although before we got him I had heard from somebody that had played with him, another player that said, ‘Hey, this guy is a lot better than what you hear. He’s actually really good over there. He has great hands.’ That’s what I’m seeing." At second base, Scooter Gennett has started against right-handed pitchers and Rickie Weeks has started against the four lefties the Brewers have faced. Weeks has just three hits in his first 19 at-bats of the season, but Gennett’s track record of struggling against left-handed pitchers makes the platoon plausible. Gennett hasn’t torn the cover off the ball in the early going either, hitting .258 with two extra base hits and three RBI. "I’m fine with platooning until one of them gets so hot that he’s going to play all the time," Roenicke said. "That’s fine. We’ll go this way for awhile and see where we are. Scooter has been swinging the bat pretty good, and Rickie has been better the last couple of games. Hopefully we can get him going. "I think it can be a nice combination. It can be a really good offensive combination and then they split the time out there on defense." Early returns: Managers expressing negative thoughts on Major League Baseball’s new instant replay system have been a topic of conversation around the game of late. What’s Roenicke’s biggest beef? Milwaukee’s skipper doesn’t like the fact that he has to go out and kill time with the umpire while his staff determines if the play is worth using a challenge on. "I’m used to running out there, saying my piece and then going back," Roenicke said. "Now I have to stall — and I’m not a big yapper anyway — so it’s really uncomfortable. I need to do a better job of it. I really do. I don’t like the way it is right now. "I don’t like that I have to go out there on every close play. That’s not what we wanted to do when we were setting this whole replay thing up; we just wanted to get the plays right. But because there’s no easy way to do it, it forces me to go out there on every close play. I really don’t want to do that." Although Major League Baseball may not like it, managers are slowly walking out of the dugout to give as much time as possible to those watching the replay. They are then trying to position themselves between the umpire and their dugout to be able to see the signal from someone on the bench. He prefers the players to be the ones stalling on the field while a decision whether to challenge or not is made, instead of the managers having to come out every time. "I don’t want to stall this game, I want the games to go quicker," Roenicke said. "It’s a big concern with baseball and it’s a concern with me. I don’t like three-plus-hour games, so the quicker we can do this, the better. That’s probably the main thing that’s going to happen — how can we do this thing right and still keep the game flowing?"